Our day began early, as it often does on Fridays, with a meeting of the Guild Leaders for breakfast. And right off there was a major success! Arlene had written to the ACS asking that there be some programming at the conference addressing the ongoing Dairy Crisis for both organic and conventional producers of fluid milk. At the meeting ACS Executive Director Nora Weiser announced that a previously scheduled presentation had to be canceled and that the ACS wanted to replace it with a networking forum on the issues around the Dairy Crisis. So important, and big thanks to Arlene for pushing that forward! Although there is little scientific support for the 60 Day Rule, that practically there is little probability that it could be or would be changed because of the difficult rule making process that would need to be followed. Nora also announced that ACS was beginning the work on developing a Certified Cheese Maker exam, beginning with the established exam that Wisconsin currently uses. It was great to see all our fellow Guilders, if only early on a Friday morning once a year. One other items brought up is that ACS helped to fund a website to promote communication and discussion among different Guilds year-round. 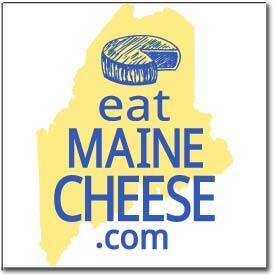 Although it was launched last September there was still limited engagement with the website among more than one Guild (Maine!) but at the meeting the Guilders expressed a renewed interest in engaging in and using this tool. And with that we had already gone 30 minutes over our scheduled time, but as Nora pointed out we almost always do, and she promised that next year she would build that in! 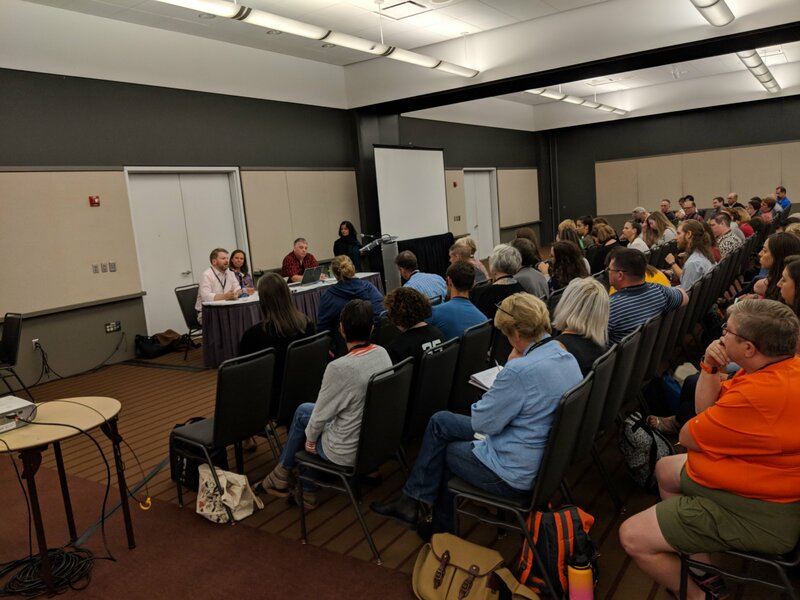 A large crowd filled the meeting room where this panel discussion took place including some very big names in the cheese world to hear more details on what is clearly a very hot topic. And oh, my, what an exciting, important, and at times difficult conversation was had. This is the kind of session that really makes the trip to ACS worth the time and money. If you don’t already recognize the Percivals names, they co-wrote the important new book on the history and future of a cheese industry focused on quality rather than quantity – Reinventing the Wheel. In that book they refer to an ideal kind of cheese as “Real Cheese.” That judgemental label would normally be controversial when speaking to a room full of cheese makers, mongers, and other industry professionals. It actually refers to a UK campaign to bring back “Real Ale” to British pubs. That campaign pushed back against the dominance of global common-denominator beers that had a stranglehold in British pubs for too long. Luckily in the US it didn’t take a public campaign to reverse the tide of flavorless industrial beer, it just took an increasing number of Craft Beer makers and consumers who sought out new and different beers (see Day 1 summary of the Fermentation Revolution for more detail!). We’re all familiar with the “Artisanal Food” idea and claim, however they made the point that there is no true ‘certification’ of what “Artisanal” means. Therefore the term means whatever the person saying it wants it to mean, and therefore it is ripe for co-option by industrial food producers. It’s pretty clear that there’s a good chance small food producers will lose the ability to meaningfully use the term in the future. So when/if that happens where do we go? Simran expanded the idea of the challenges of creating Real Cheese from the milk quality itself to the labor aspect as well. Low wages have led to a lack of skilled dairy laborers which has moved many dairy farmers to look seriously at robot milking machines. Bronwen said that the important point of this story is not that the robots mis-handle the cows – on the contrary, they are well engineered to make the cows as comfortable as possible – but that the robot milkers are optimized for the production of liquid milk that is intended to be pasteurized (and chilled immediately). If the robot milker becomes more common that would reduce the opportunities for cheese makers to access milk in the specific way that they would like to receive it. This was followed by an exchange among all the panelists about how hard it is to actually produce good quality milk for cheese making and that this work was often lost on the consumer. To counter this Bronwen pointed to Nick Millard the herdsman at Haford Cheese, the UK’s oldest organic dairy, who has become an Instagram star by illustrating the work that he does every day. The problem, Francis said, was that of information asymmetry: we [the conference goers] know how much farmers work and what it costs to make good milk. The problem is that the customers do not know this, so all they see is the price of the resulting cheese. He pointed to the classic economics paper by George Akelof called The Market For Lemons, which focused on the used car market in the 1970s, and it proved that MORE information for the consumer increased the size of the market. That said, Francis continued, it’s a very difficult ask of retailers to go into deep detail about why one specific cheese they sell is unique because the danger is that the parallel message the customer received is that all the other cheeses being offered are flawed in some way. Gordon said that this was true, but that a good retailer knew how to walk that line between featuring a cheese and denigrating others. He encouraged cheese mongers to “keep pushing the envelope with consumers” by walking them just a little farther down the education path each time you see them at the shop. At this point Francis and Bronwen wanted to make sure people understood that despite their illustrations of the benefits to Real Cheese of many of the old and “inefficient” methods of cheese making, that their counter mantra is to “Optimize without Compromise.” Francis told the story of a Loire goat cheese maker they visited that was making the most perfect old fashioned aged goat cheese logs that seemed to be the result of hundreds of years and many generations of perfecting the process. But when he asked the cheese maker about the years and generations of experience that went into their product, they laughed and said I used to be a bookkeeper and I wanted a change of pace, so I bought this business and the equipment four years ago then learned how to do it… Their advantage, Francis said, was that in the Loire there was a wealth of resources (refrigeration, equipment, herd management, etc.) devoted to chevre makers. That made it easy for a newcomer to achieve an optimized process quickly. It’s the cheese maker that has to “reinvent the wheel” at every step of the process, and has few options to access skilled resources who understand the business, and has to work with sub-optimal equipment who experience the “pain” we just talked about. However, THIS was where state and local governments could step in and invest in growing a specific industry (in this case cheese making and its ancillary businesses) without picking winners. From the cheese monger’s perspective, Gordon encouraged the retailers in the audience to commit to on expensive cheese for six months or a year in their shop, introducing as many of their regular customers to it as possible. “It won’t necessarily make you money, but it will do a good thing…and there are many stories about the difficult-to-sell cheese of today becoming the must-have cheese that is difficult to keep in stock tomorrow. And with that Simran opened the floor to the audience. One person asked Gordon or Bronwen if they knew of any mongers that organized their cases thematically in a way to identify a group of cheeses that had similar production philosophies. Neither of them offered an example, but Francis claimed that Bronwen was being too modest: at the Neals Yard Dairy shops the mongers often created a thematic structure to the display cases that weren’t always obvious to the buyer, giving those mongers an opportunity to dive a bit deeper into what cheeses they carried and why they were arranged that way. That said there are still no actual certification programs that can guarantee a product to be made exactly the way it’s described (in many cases). Another audience member asked how a focus on biodiversity in cheeses can square with the parallel focus on food safety? Bronwen pointed out that it is now very different in the industry than it had been even ten or twenty years ago, because “science is on our side!” Science is proving that cheeses made with a focus on biodiversity are being made safely. At the same time the fundamental question becomes what is the acceptable risk in eating any cheese, but particularly biodiverse cheese made from raw milk? If the answer is that no risk is acceptable then we’re lost. Because, as we see in the news all the time, NO food is without risk, including any kind of cheese. If we can quantify the risk of eating cheese, and then use science to reduce that risk to an agreed upon acceptable level, then we can have Safe Cheese that is Biodiverse. Another audience member stood up to challenge the idea of “Farmhouse” cheese being the ONLY type of cheese that can be considered “Real Cheese” making the point that there are many cheeses made by cheese makers who do not produce their own milk, and yet have a limited or even single herd source for that milk, as well as a business relationship with that dairy farmer. Frances admitted that in France they do break up their classification system into “fermier” (Farmhouse), “artisanale” (small producer that buys in milk), “cooperative” (dairy with local milk supply that may come from multiple farms), and then “industriel.” He admitted that his idea of “Farmhouse” only is extreme, but on the other hand it’s the only label that’s externally verifiable. A small producer’s milk supply is only as good as the contract they’ve signed promising to purchase the milk, and those contracts can vary and are not always transparent to the consumer. And then they had to end the discussion. Nothing was solved, but a lot was said about a subject that everyone clearly cares a lot about and continues to struggle with. 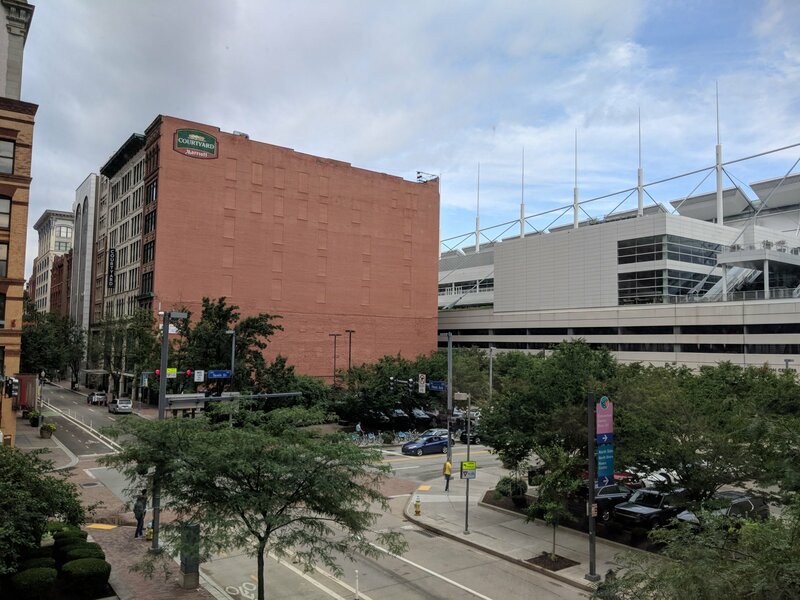 ← Day 1: Welcome to Pittsburgh!